and maybe I will, but not now. For now I will instead go back a few steps from that thought and write a few words about these three video documents. After that, I decided to indulge in more video time, and was happy to take a punt on an algorithmically recommended video from a maker I do recall seeing things from before. I’m not sure what it say about me that I choose this sort of thing as entertaining: Olber’s Paradox – A Level Physics. I didn’t even do A Levels, but this evening I did enjoy this offering from a series of revision videos. Spoilers: the paradox is to do with how the sky appears dark at night when, from a given cosmological point of view taken with some logic and bit of pi R squared type stuff, it ought not to. 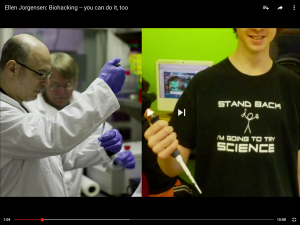 The third is a TED talk from 2012: Ellen Jorgensen: Biohacking — you can do it, too.